Looking for some Hawaiian party ideas for your next outdoor party? Get some great tips for decorating, food and games. 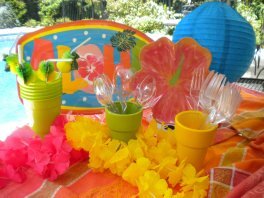 A Hawaiian or a Luau party is a great party theme for kids, teens or adults. What could be more inviting and colorful than Hawaiian party decorations of flowers, bamboo tiki torches and grass skirts. Be sure to have your outdoor speakers playing some Hawaiian music. This set of 25 invitations sets the theme for your luau themed party. 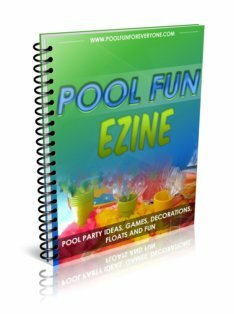 Invitations help build excitement and enthusiasm to a themed pool party. Let your guests know to wear or bring their swim suit and towel. If you are going to have any contests for the best looking Hawaiian shirt or flip flops let your guests know that in the invite. Of course include important info on the date, day, time and location. Hawaiian party decorations need to colorful and bright. Pick a color scheme and repeat it throughout your decorating. Lime green, bright yellow and ocean blue are great tropical colors to reflect your theme. These huge tissue paper flowers greeted guests at the pool gate. They are attached to the painted dowels with a pipe cleaner and strips of green tissue paper are taped to the dowel. There is an abundance of Hawaiian party decorations at stores like Party City, your local Dollar Store, or Hobby Lobby. 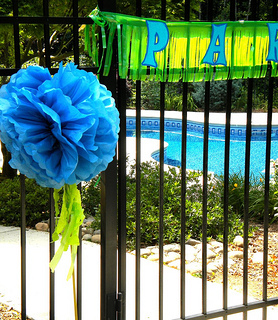 Use brightly colored paper goods, place bamboo tiki torches around the pool area or by the pool gate. Decorate with colorful leis and fresh local flowers. Purchase a whole pineapple that is uncut to use as a table decoration. Pick a color theme like this bright orange, yellow and lime green. Include some fun inflatables like palm trees and parrots to place around the party area. First impressions communicate that guests are entering into the Luau Party zone! So I always decorate the pool gate and around the path entering the pool. 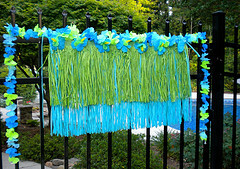 This pool party decoration is actually a grass Hawaiian skirt tied around the pool gate with a long stringed floral lei draped on either sides. 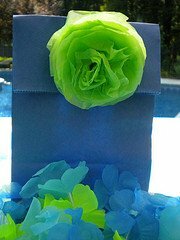 Small tissue paper flowers decorate the luau party bags. Trace a 3" circle (use a small glass) around 12 layers of tissue paper. Using a sharp tip - like the tip of a paper clip - punch two holes in the center of the tissue paper. Insert a twist tie or pipe cleaner in the holes. Then bring up each layer of tissue paper to the center and scrunch it a bit. I also made larger tissue paper flowers - 4" ones and attached them with the pipe cleaners to vines growing on our backyard arbor. The party bags are just blue lunch bags purchased from Target. Trim off the top of the bag with a decorative scissor. Fold over the top and punch two holes in the middle. Attach the tissue paper flower with a twist tie or pipe cleaner. 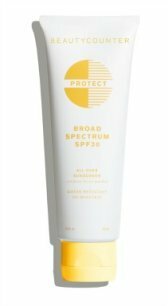 Some ideas for party favors are small bottles of lotion, body wash, or sunscreen. Small scented soaps or flip flop notepads make great little gifts as well. Place these 5 feet tall inflatable palm trees by the pool gate to greet your guests or place them around the perimeter of the pool. I love to decorate with inflatables - it doesn't matter if there is a little drizzle or rain. They can be close to the pool and get wet or use them in the pool for some fun. Since they are light weight you can easily move them around. They are available as a set of two from Amazon at just over $20. There's nothing that speaks "Hawaiia" louder than a green grass table skirt. Made of plastic, it can be used more than once. This one from Amazon is 8' long and goes around the perimeter of the table - get a green plastic table cloth from the dollar store to put on top. Hang it with double sided tape around your tables or outside bar area. 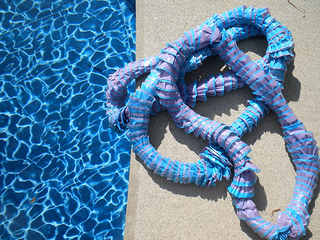 Hang this lei garland around the pool fence. It's plastic so it can get wet. If you decide to cut it up - be sure to secure the ends or the flowers will come off. The bright colored flowers and long piece of garland will help to decorate any large space. 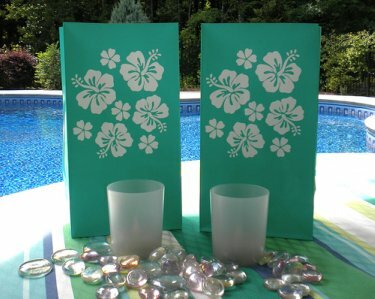 These Hawaiian themed luminary bags were a great find. Use them to light paths, sidewalks or steps. 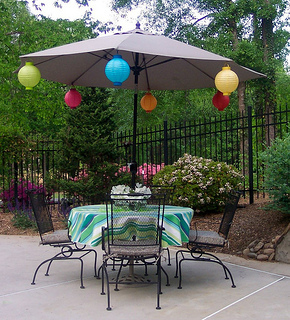 Hang assorted colored lanterns from your outdoor umbrella ribs. If it is an evening party, get battery operated ones to light up the party. When a party is outside - think big - so get at least a 12" lantern rather than an 8" one - they are just too small to give that punch of color. Most of them take 2 AA batteries so stock up on them. We find the batteries will last for maybe two evenings for a couple of hours. You can also hang these outdoor party lights from tree branches or on outdoor shepherd hooks. 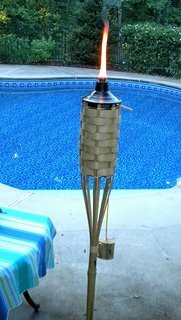 For an evening party place bamboo tiki torches at the entrance to the pool and around the perimeter of the pool. These torches not only provide light but if you use tiki-style torches you can also keep the bugs away. In this case more is better - light up pathways and stairs as well as the pool so that there is plenty of light. Looking for Hawaiian party food ideas? Want something that is easy to prepare so that you can have fun at the party too? Hawaiian or luau party food needs to include lots of fresh fruit like pineapples and mangos. Start by serving this refreshing pina colada smoothie recipe using coconut milk, frozen pineapple and bananas, serve in insulated plastic glassware decorated with a pineapple straw. 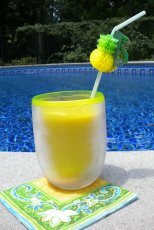 Serve a tropical drink served with a fun straw like this one with pineapples. You can also get fun straws with flamingos or flower ones as well. 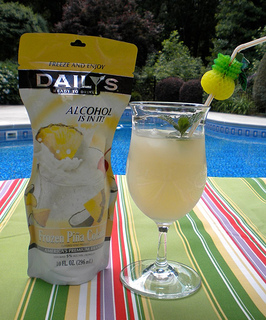 I used this pina colada smoothie recipe for a last minute evening by the pool with neighbors. My friend Ola brought over her cordless blender and some cut up pineapple. I brought out the rest of the fruit and a coconut juice blend to serve as the liquid. The Breville cordless blender worked great and made it possible to make the smoothies out by the pool. For my fruit smoothies, I always use frozen fruit. Even the banana is peeled, sliced and put into little baggies and frozen. I am a registered nurse with a special interest in nutrition so most of the smoothies I make are not only good tasting but also healthy. Ideally, it is better to buy frozen, organic fruit or fresh, organic fruit and freeze it. The coconut flavor came from this organic fresh pressed coconut fruit juice blend that I bought in the organic food section at the grocery store. It is called Lakewood Organic Fresh Pressed Coconut juice. But some other coconut milk would work as well. Mix in your favorite blender until smooth and serve in chilled glasses with a fun tropical straw. 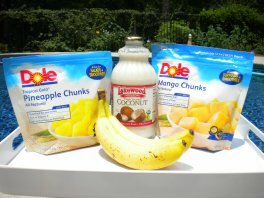 Or for simplicity keep several of these pre-made alcoholic tropical drinks in your freezer for an adult gathering. If you like to use your grill, grill chicken breasts that have been marinated in teriyaki sauce and then top them with mango salsa (I purchase the salsa at Target). 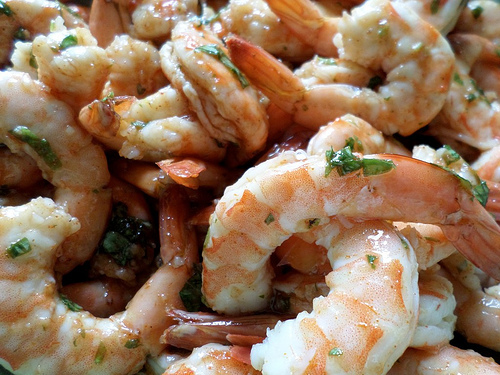 The best grilled shrimp recipe is from my sister and it's now my "go to" recipe whenever we service shrimp. 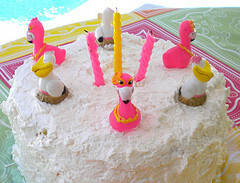 See pictures and get ideas for some fun luau cakes and cupcakes too - coconut is the key word here. My sister served this grilled shrimp at her home and told me it was one of her "go to" recipes for company. Now it is mine as well. Common ingredients that you most likely have in your kitchen, like tomato sauce, olive oil and garlic make it simple to make at the last minute. And the basil gives great flavor while the cayenne pepper gives it a little "kick." Serve it on a bed of rice or quinoa. Stir until all of the shrimp are evenly coated. Preheat grill to medium heat and spray the grates with oil. Thread 5-6 (I used jumbo shrimp) one each skewer. Wooden skewers can be soaked for 30 minutes before adding the shrimp. Discard marinade. Cook for 2" to 3" per side or until they turn opaque. Finish the evening with a luau cake. A coconut cake that is easy to make and can be prepared several days in advance is the perfect choice. Made with Cool Whip and shredded coconut, the frosting is light and cool. Keep it in the refrigerator and serve cold. This is a great luau cake recipe. 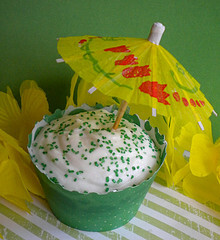 Luau cakes or Hawaiian cakes make the perfect ending for a fun Hawaiian themed party. Try my easy coconut cake recipe. Using a butter cake mix, my favorite is Duncan Hines, the cake is so moist and tasty thanks to several layers of frosting. The light and fluffy frosting is made of my favorite ingredient - Cool Whip - with fresh coconut and sour cream. Served cold - it is so moist and refreshing. Carry your party theme right to the very end with these Hawaiian party ideas for cupcakes using colorful cupcake wrappers, colored sugar, and little Hawaiian Paper Parasol Picks. 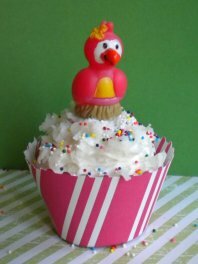 Top the cupcakes with colorful plastic finger puppets of bright pink flamingos and sea gulls, which I found at Oriental Trading. Sprinkle some fresh grated coconut on top of the frosting with just a few colored sprinkles. Creative cupcakes served on a cupcake stand can be used as a centerpiece as well as the dessert. Easy to serve, no cutting pieces of cake and no need for more plates and forks make these Hawaiian cakes the perfect pool party food. Looking for some more Hawaiian party ideas for games? Ice breakers are always a great way to get a party started. As the guests first arrive place a colorful lei around their neck. When all the guests have come, instruct them to find an other guest with the same color lei. Have a couple of questions for them to ask each other like, "Tell me about your most favorite warm weather vacation" or "If you could travel anywhere what location would you like to go to." Of course for the younger crowd there is always the Limbo game. But my favorite is a hoola-hoop contest. Have two at a time hoola-hoop to Hawaiian music and see who does it the longest. Continue until everyone has a turn. The winners of that group then compete with each other until you have one person who has "hoola-hooped" the longest. A fun pool party game is to divide the guests into two teams. 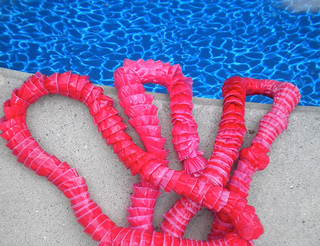 Use the plastic leis that can get wet. Half the team is on the deep end of the pool and the 2nd half on the shallow end of the pool. The first swimmer swims with the lei on his/her neck to the players on the deep end and gives the lei to his waiting team member. That player swims back to the shallow end with the lei and gives it to the next waiting team player. The team that finishes first wins. So start your party planning with these Hawaiian party ideas for food and fun for a memorable day with friends.